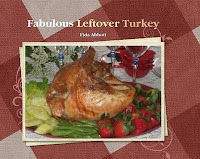 Fabulous Leftover Turkey is The First Book of Amerindo Kitchen in Series. Now, with only $ 10.00 (for US country) and $ 15 (for outsite US countries), you can read this fabulous cookbook in e-book version in CD sent via mail to your home address. All revenue will be donated to Cystic Fibrosis Foundation and used to promote my other books to support Cancer Reasearch Program and Unreached Children Program. To read its details and see some pages inside of this cookbook, visit this special link. If you are curious why I support three causes above, please read this link. All payment should be made as donation via Paypal. Please, click logo below to make a donation! E-book will be sent in CD via mail to your home address. Please, write your home address in the message via Paypal. Through the publishing of this book, Fida Abbott has shared her approach to American cooking through the eyes of someone fairly new to the United States. She brings forth fresh culinary ideas combined with personal tidbits that endear you to her and this ambitious effort. A first look at this recipe book was a bit daunting. Maroon-brown hard cover with that crispy-but-juicy look of the turkey and all the trimmings will surely bring up your appetite. "Fabulous Leftover Turkey", really?? With so many turkey recipes out there what makes this one stand out? First, it's the creativity of the author, Fida Abbott, who smartly combine two great cultures: Indonesia, where she from, and America, where her husband from, into these recipes. The result? Ten great dishes that are easy to prepare. Second, not like others, the author also shares her story of how she came up with recipe ideas and it's background. This makes cooking more enjoyable. Third, pictures are nice. Even though they could be more attractive if they were more focussed and clearer. I personally like the setting and layout, even though in some pages margins are uneven. But it doesn't hurt much. Four, this book is for everyone. I'm vegetarian, but that doesn't mean I cannot use this recipe book. It gives me confidence to play around with non-meat ingredients. That's what's fabulous! I definitely will recommend it to you. Can't wait for another series, Fida! Two words I can describe about this cookbook; attractive and creative. I enjoy the stories the author wrote. Photographs are great. I hope she will publish the second book soon and keep supporting the others who are in need.